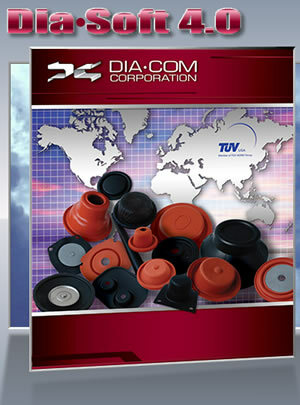 DiaCom has advanced the "do it yourself" design concept to the next level. Not only can you create your own diaphragm, the software now transfers your specifications from the application data form to a fully dimensioned drawing. The software also has a screening room allowing users to view the diaphragm in motion. Enhanced 3D animation allows users to visualize the movement of a rolling diaphragm and isolate the movement in any point during the stroke. Other special features include: direct link to our E-mail and Web site; formulas that calculate burst, stroke, and height requirements; complete pressure and metric conversions; new available sizes and hardware design considerations; a fabric information table and a comprehensive fluid resistance chart for elastomer selection. Dia•Soft® 4.0 is now completely web based and can be used free of charge!